Salma Hayek's husband François-Henri Pinault announced his generous donation to rebuild Notre Dame following Monday's devastating fire that caused extensive damage to the historic church in Paris. Watch for more details on the French businessman's multi-million dollar pledge. Two of France's richest men, long locked in a very public rivalry, are once again pitted against each other — this time over flashy and competing donations to rebuild Notre Dame. Billionaire luxury tycoons — Bernard Arnault, 70, and Francois Pinault, 82 — are among France's fiercest business competitors and patrons. Hours later, Arnault shot back with an announcement that he, his family and his luxury company LVMH would pledge double that amount — 200 million euros ($226 million) — for the restoration of the church that was immortalized in Victor Hugo's 1831 novel "The Hunchback of Notre Dame" — an eternal story of obsession and jealousy. Along with commitments from other benefactors, at least 500 million euros ($564 million) have been pledged to the rebuilding effort, NBC News reported. Apple CEO Tim Cook said on Twitter that the tech giant would be donating to efforts as well, "to help restore Notre Dame's precious heritage for future generations." Notre Dame, the American university, announced Tuesday that it would donate $100,000 to repair its namesake in France. But the sudden outpouring of generosity has left the building's senior fundraising adviser frustrated, he told NBC News, since it's more than three times the amount that France's Ministry of Culture determined the building needed for renovation in 2014 — an amount that the church was still fundraising for when the fire broke out. 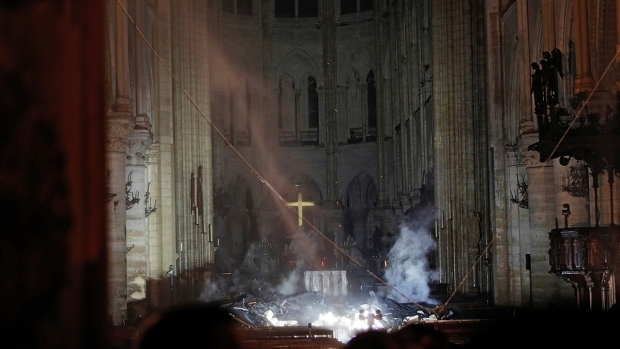 "The importance of restoring this cathedral is only in the full light today, which is frustrating because part of it has been burned in the fire and has now disappeared," Michel Picaud said. Nevertheless, Picaud is "quite grateful" to the donors stepping up now, saying, "We absolutely need billionaires contributing to this." Arnault is France's — and Europe's — richest man and CEO of the world's biggest luxury group, LVMH, the owner of iconic fashion houses Louis Vuitton and Christian Dior. Pinault founded the world's second-biggest, Kering, formerly PPR, that acquired rival brand Saint Laurent in a face-off. Both men also possess a sizeable art collection — and a desire to show it off in competing museums.